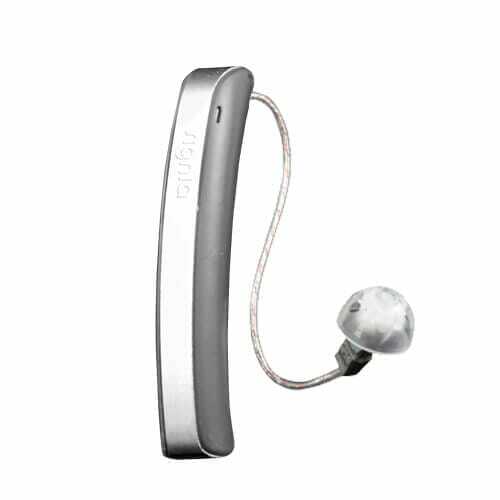 The Signia Styletto 5Nx is Signia’s fashion forward, ultra-slim, rechargeable hearing aid. Signia Styletto 5Nx utilizes advanced “Own Voice” technology* plus rechargeability. Own Voice Processing detects your own voice and adjusts automatically to provide clearer, sharper hearing in conversations. Signia Styletto along with its’ charge case, allows up to 4 days of use at up to 16 hours of wearing without having to plug it into the wall for recharging. Signia Styletto 5Nx also has up to 6 preset hearing programs, ear-to-ear communication, tinnitus therapy features and is TeleCare 2.0 compatible for remote programming and adjustments. Signia Styletto is IP68 rated meaning it is highly perspiration, dust and water resistant for those times you forget you are wearing them. Styletto provides “better than normal hearing” according to clinical studies with much better speech recognition even in noisy environments. Styletto makes a fashion statement in its slim, smooth design in three beautiful color schemes: Granite and Silver, Cosmic Blue and Rose Gold, and Snow White and Rose Gold. While Signia Styletto is not capable of streaming calls or media from smartphones, programs and volume can be changed via the free touchControl app for both iPhone and Android smartphones.